Ted Fletcher, one of Britain's most popular writers of how-to-do-it books for detector users, has combined brilliant colour photography with easy-to follow instructions that will guide every reader to spots on British and north European tidal rivers where more than 2000 years of human activity has left a wealth of fascinating losses and throwaways between the high and low water lines. The rivers around our coastline have frequently been flooded in recent years. Millions of gallons of rain water, combining with the effects of exceptionally high tides, have stripped many estuaries and tidal river banks of mud, sand and gravel to expose numerous coins and artifacts to the eyes and hands of experienced mud larks and detectorists who know where to hunt for them. Now, thanks to a book that is packed with detailed illustrations showing precisely what clues to look for on tidal rivers, any reader can become an expert on mudlarking and riverside detecting. 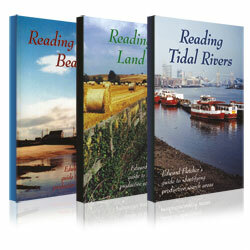 In Reading Land the author, Ted Fletcher, aims to draw the readers attention to the sites (which he calls "nodal points of communication") where people have congregated in the past and where, by definition, the occurrence of casual losses of coins, jewellery, artefacts etc increases dramatically. This A5 title of 100 pages has 57 informative illustrations and is sure to help you locate the most productive areas to search with a detector or eyes only. In Reading Beaches Ted Fletcher tells you how to be in the right place, at the right time and with the right detector and shows you how to identify the most productive search spots.